When it comes to renovating and remodeling commercial and retail spaces, you might be surprised to learn that less can often transform into more—as in more of an impact on your bottom line. To find out how to ensure that the ‘less is more’ truism rings true for your company and/or clients, we recently asked several experts in retail design and commercial property management for their suggestions on how to get the most bang for your minimal-renovation buck—while keeping the total amount of those bucks as low as possible. Along with modernizing your lighting, landscaping and layout, these go-to gurus offer guidance on everything from the strategic use of paint and color to what finishes and fixtures should be updated. What follows is their real-world advice, as well as some examples from their own professional experiences. Note that while some of the information is specific to retail venues, some to office environments, and some to commercial spaces, most suggestions can be applied to any area undergoing renovation and/or remodeling. Jeremy Codiroli, owner/lead analyst of Sensum Consulting. The Richmond, Virginia-based company conducts product-specific profit analyses for retail venues. Richard V. Colucci, founder/president of Distinctive Offices. The New York City-based company specializes in the renovation of existing built-out office space with minimal disruption to business operations. Alan Guinn, CEO/managing director of The Guinn Consultancy Group, Inc. The Bristol, Tennessee-based company assists businesses with a wide variety of issues, including business development, strategic planning, and the taking of ideas from the conceptual stage to application. Dan Jasper, vice president of public relations for Mall of America (MOA), and Nathan Klutz, MOA’s construction director. 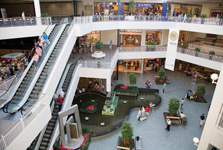 Located in Bloomington, Minnesota, MOA is the nation’s largest retail/ entertainment destination with more than 40 million annual visitors, 520 stores, 50 eateries, the nation’s largest indoor amusement park, SEA LIFE Aquarium, and much more. MOA is currently in the third year of a four-year renovation project, as well as an expansion project that will include a 342-room JW Marriott hotel, an office tower, another 50+ shops, and more. Stefanie Means, LEED AP, interior designer/ associate principal of Callison Architecture, a global architecture and design firm specializing in the retail, corporate, mixed-use, urban planning, and residential and health care markets. The company has offices in Seattle, Los Angeles, Mexico City, Dallas, New York, Scottsdale, London, Dubai, Beijing, Shanghai and Guangzhou. Guinn: Paint should be considered as a primary element of the environment. Paint offers an amazing array of palette blends because of its excellent abilities to undergo gradient color changes against either small or larger surface areas. Direct lighting on dimensionally painted surfaces will help to create an amazing statement about a project and can serve as a focal point. If glass is used in interior development, the color palette used can be carried throughout each wall of the project. Means: Refreshing a retail environment with updated paint colors can be an inexpensive, yet effective, way to breathe new life into the space, attract customers, and potentially increase sales. Paint colors should complement (not overwhelm) the merchandise, and should provide a backdrop for highlighting the merchandise. Jasper and Klutz: Our extensive renovation and expansion project addressed the issue of color—in paint and materials—to meet our design goals. The new color palette is white/off-white in flooring, wall covering, paint, ceilings, etc. The idea is that white is timeless and elegant. By using this very clean, refreshing color palette, we are able to highlight our tenants’ storefronts rather than emphasizing the architecture of the mall itself. We wanted the store/restaurant fronts to do the talking—to really pop when seen by customers. Colucci: One of the things that we do is change out the Sheetrock walls that separate private offices from the general area and replace it with glass partitions, allowing natural light to shine through the entire space. In addition, something as simple as changing the lightbulbs to a cooler white can have a great impact as well. Guinn: It’s important to recognize that new light fixtures are quite useful as a significant step in moving the appearance of a project from ‘dated’ to ‘new and exciting.’ A change from fluorescent to softer forms of light removes so many harsh shadows indicative and reminiscent of old offices, factories or retail spaces. Natural light can be implemented by using skylights, but be careful using skylights in severe weather or seismically active zones. Codiroli: We recommend that the areas with the most light feature the most profitable items. We have found that this results in more profit than if the entire store was fully lit at the same level. Customers are naturally attracted to these highly lit areas and see the product as more appealing. Colucci: Changing the flooring gives the biggest impact to the environment. With advancements in carpet and tile design and lower costs, we are able to change out the flooring without disrupting the flow of business for a tenant. Guinn: Updating flooring is an excellent way to make an older project ‘new’ again. I’ve seen some excellent acid-washed and stained-concrete [flooring], which allows for heavy usage for some projects. In a wet environment, this would allow a sand/epoxy seal to minimize slips or falls. Means: New flooring can completely change the overall feel of a space, even if that’s the only thing that changes. For example, replacing a tile or stone floor with wood can bring warmth into a space and can feel either rustic or elegant, depending on the color and type of wood. Adding area rugs over hard flooring is an easy way to add personality and update a space. Codiroli: Items that have been deemed as ‘high-profit’ are most likely to be purchased if they are placed at eye-level to the customer. We use ergonomics to determine the perfect height—this comes after analyzing [characteristics of] the most frequent customers. Means: In smaller renovations, traffic flow can be altered by rearranging furniture and fixtures or changing flooring types to create aisles or paths. On a past retail remodel, we were able to change the floor plan by removing tile aisles and carpet inserts, and stripping the floor down to a stained concrete. It was a successful way to create flexibility and promote wandering. Jasper and Klutz: Rather than having a narrow hallway connecting the current mall to the new addition, tenant spaces are being removed to widen the ‘throat’ that serves as an entrance into the new expansion. The design of this throat is to draw people into the expansion so they can visit the new shops, restaurants, hotel, and other new elements. Jasper and Klutz: The Mall of America has more than 30,000 live plants and more than 300 live trees throughout the building. The original idea was to help people feel as though they are outside—especially during the cold Minnesota winters—and to benefit the environment. The plants act as a natural air purifier and offer shade to the amusement park. Just outside the new front door, we are creating a beautiful plaza that will include special planting beds, which can be changed out seasonally and for special events. For instance, we host the Susan G. Komen Twin Cities Race for the Cure walk every Mother’s Day, which draws more than 50,000 participants. These new planters will allow us to plant pink flowers timed to bloom at exactly the right time. We will also use this strategy for other seasons and events. Guinn: Landscaping options blending continuous outdoor/indoor planters can create a living wall of green, mixing appropriate outdoor heat and moisture with an indoor blend of vibrant greenery. Mixing glass walls and green plants conveys a sense of light and airiness to any environment. Guinn: We’re big on reuse of older items. Often, old warehouse-type lighting can be painted and simply ‘rebulbed’—the fixtures lowered and secured in place at minimal expense. Ceiling surface textures can be reviewed for utilization and can be sprayed black to give depth and dimension. Another option is to use new flex HVAC duct and, if allowed by code, to paint the ducting with vibrant colors, blending principally primary colors against a dark background. Means: Adding or changing wallcovering can subtly or dramatically update a space—and it’s simple and fairly inexpensive. Sometimes, wallcovering is used to create texture or provide a backdrop for highlighting merchandise or other elements, but current trends are leaning toward bold, heavily patterned wall-coverings that make a statement. Colucci: A fun and functional product that we put into offices, open areas, and conference rooms is a painted surface that allows you to use dry-erase markers on the walls. This is great for meetings, but also great for announcements like birthdays, etc.